If you've always thought of Tuscany as an expensive destination, take a look at this bite-size guide to the region's thermal baths, where you can enjoy the water- for free! Legend has it that the hot springs of Saturnia formed on the spot where a thunderbolt hurled by Jupiter against his brother Saturn during a terrible quarrel landed. Although Saturnia is now one of the most famous spa towns in Italy, home to luxury hotels and wellness centers, you can still find a few spots in which to reap the benefits of the water for free. The hot spring surfaces from a volcanic crater where today's main thermal station stands and then flows down the valley along the river Gorello in a series of waterfalls called "Il Molino". The scenery is often quite surreal: the elevated temperature of the water shrouding the landscape in great clouds of steam. A moonlit bath in the waterfalls is an experience you won't want to miss. 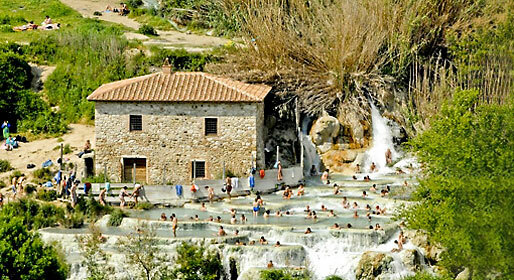 In summer, you're unlikely to be alone: Saturnia's free thermal baths are extremely popular both with locals and tourists. The presence of hydrogen sulphide and carbon dioxide make the waters of Saturnia particularly beneficial for the skin and the respiratory system. The village of Bagno Vignoni is famous for its main square, almost entirely occupied by the bath built by the Ancient Romans and filled with steaming thermal water. Although you won't' be able to bathe in the pool, you can still enjoy the benefits of the town's natural hot spring water, a hundred meters or so downhill at the Parco dei Mulini. 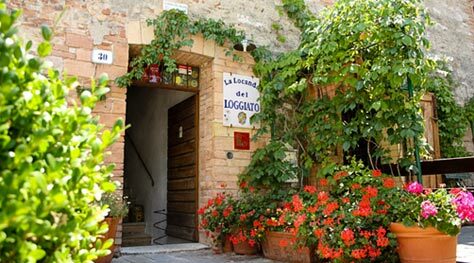 The village stands atop a hill which slopes gently toward the river Orcia. Here, via a series of little streams and cascades, the thermal water collects in a pool surrounded by reeds and bushes. The place is idyllic but the water is only lukewarm, so only really suitable for summer bathing. San Casciano ai Bagni, in the province of Siena, has some 42 hot springs, making it the third largest spa complex in Europe. 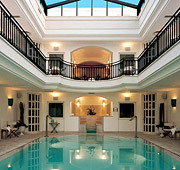 Famous since the times of the Ancient Romans, the town's baths were, indeed, Emperor Ottaviano's favorite. The views from San Casciano, which lies at the foot of Mount Cetona, are beautiful. To reach the baths, from the town walk along the main road up to the spa complex, to the right of which there is a stream of thermal water which forms small pools and waterfalls where you can bathe surrounded by nature. For a truly unique experience, take a bath in the 40°C water filling the ancient stone tubs and sinks situated at the bottom of the town. The Ancient Romans were experts in thermal water and it was Cicero who first wrote about the beneficial properties of the water of Petriolo, the little village located just a few kilometers southwest of Siena, on the banks of the river Farma. The village's first spa was built in the 15th century and you can still admire the ancient brick structure to this very day. To reach the free hot springs, leave your car in the spa's car park and walk upstream for about 15 minutes. In the middle of the creek, you'll see a white rock, known locally as the 'fungo' or mushroom, from the central orifice of which the thermal water spouts out. Petriolo's hyperthermal water is rich in mineral salts and sulfur, this latter responsible for both your velvety soft skin and the rather unpleasant smell of egg! Although the thermal water surfaces at a piping hot 43°C, there are a number of natural pools where the temperature is lowered by the presence of river water, thus allowing for pleasant and relaxing bathing. As you approach Monte Amiata and the town of Castiglione d'Orcia, you'll come across some of the most spectacular (and free!) 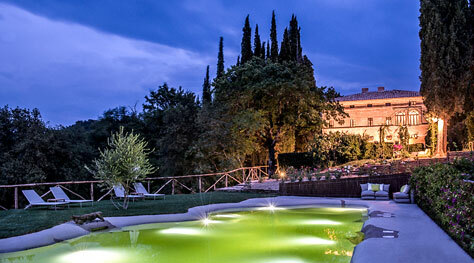 thermal baths in Tuscany: those of Bagni San Filippo. From above the town, a footpath leads through thick vegetation into what can only be described as a dream landscape. Here, everywhere and everything is sprinkled with a thin coat of white dust. Amidst the trees and rocks, solidified waterfalls, and weird and wonderful limestone formations appear. This bleached white moonscape is created by the high quantity of calcium deposits in the water, which settle on everything they come into contact with, bathers included. The symbol of the baths is the Balena Bianca, an enormous block of the white sediment, the shape of which resembles that of a whale. The contrast with the green of the surrounding countryside is unique as are the colors of the thermal water which blend with those of the stream. Continuing down the valley, the stream flows into the Fosse Bianco, close to the thermal station. On route there are numerous little pools, both natural and manmade, in which you can bathe.